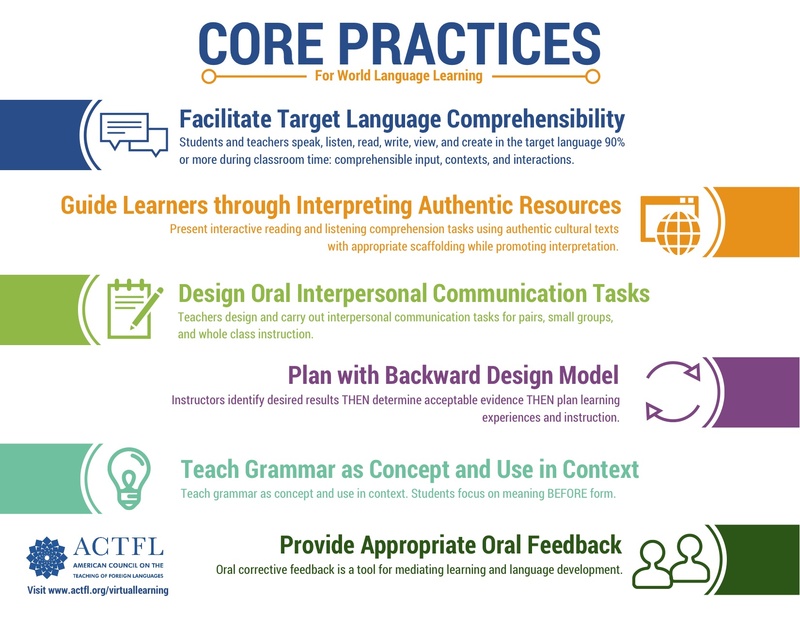 The Leadership Initiative for Language Learning (LILL) provided world language teachers with 6 Core Practices in 2015 and though some of the practices are not new to teachers, they do take some planning and effort to incorporate in teaching. For some teachers, the most challenging Core Practice to incorporate into their repertoire is using authentic resources. Yes, textbooks have a lot of information and activities already done for us. Yes, it’s nice to have a skeleton for units and lessons. Yes, they are pretty. However, consider this quote from Laura Terrill at the Central States Conference in 2016: “The kiss of death for the 21st century learner is ‘open your textbook’.” The 21st learner has access to unlimited amounts of knowledge; it’s our job to take them beyond knowledge and foster inquiry, problem-solving, and critical thinking, essential skills for this generation. Remember, too, that authentic resources are resources created by the target culture for the target culture. If a textbook were to include authentic resources it would cost thousands of dollars to cover copyrights! Additionally, students need to have experiences with the language they will encounter while abroad. This includes newspaper articles, advertisements, radio broadcasts, and posters. Our job is to help them successfully navigate real-world language. However, authentic resources take a lot of time to curate and a teacher with four preps can’t possibly move to 100% authentic resources in a single year! Luckily, there are many world language teachers who have already done the work. Check out #authres on twitter. Follow a few world language teachers or professional organizations on Pinterest. Even Facebook or even a quick Google search will bring up numerous resources. Textbooks aren’t bad, but we owe our students authentic experiences with authentic language. 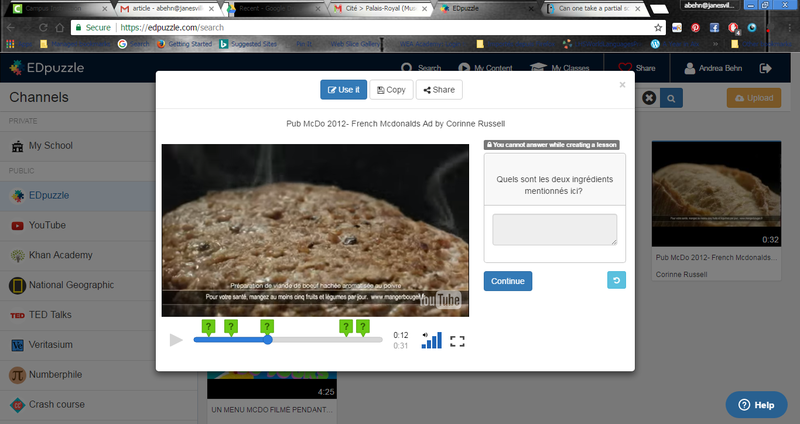 A high tech tool to use to give students listening practice with authentic resources is EDpuzzle (edpuzzle.com). This is a website in which a teacher uploads a video and creates questions for the students to answer as the video progresses. For example, if a class is studying cuisine in countries who speak the target language, they may choose to compare the eating habits of that country with their own. One of those habits might be fast food’s role in everyday life. 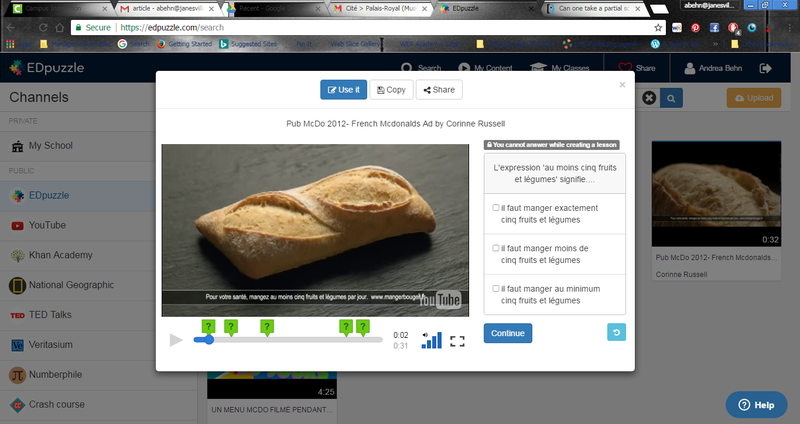 If a teacher chooses a McDonald’s commercial from the target culture, the video would be uploaded and the teacher would prepare questions for the proficiency level of the students. For example, the level 1 student might be able to identify the food items, while and upper level, intermediate student might be able to talk more about the interactions between people and tell why they occurred the way they did. Questions might be fill in the blank, multiple choice, true/false, or short answer. The excellent part is that students can repeat a portion of the video before answering or, in an assessment situation, they only get one opportunity. Because it is heavily supported by the visuals in the video, it lowers students affective filter and allows them to take in more language. This low tech idea came from the Creative Language Class (http://www.creativelanguageclass.com/) ladies. It’s called “l’écoute” (basically just listening!) and it can be used when there is no time to create something like an EDpuzzle or when the perfect video pops up on social media right before class. It builds students’ listening/interpretive skills. It also builds community in the classroom and can work as an introduction to impromptu interpersonal activities. Before students watch the video or listen to the news report or podcast, they do a little bit of work. They write the title, indicate what kind of media it is (interview, song, advertisement, etc. 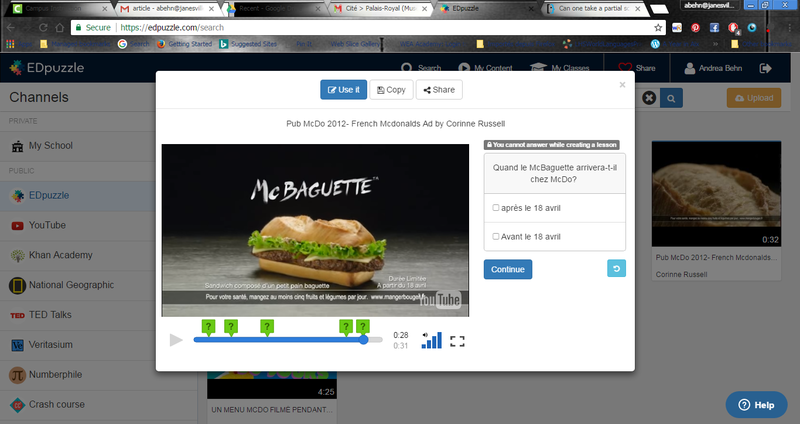 ), and then predict what the activity is about based on the title and any visuals that appear. For levels 2-AP the form would be in the target language, but in level 1, it may have only parts in the target language. The directions shouldn’t become the task. Once students have some time to process and predict, they listen the first time through. Sometimes, especially with my upper levels who can reflect on and talk about their learning more effectively, students are frequently distracted by the images in a video and forget to listen. Therefore, they listen once and write down any words, phrases, or ideas that they understand (depending on their level). When they have listened once, they watch the video and write down any other words, phrases or ideas they heard or think they heard. The second step is to have students turn to their partner and share what they heard. This should be done in the target language and the teacher may give students some key words and phrases for this activity that students can use for structure, like: I heard…, I think it said…, What did you hear?, etc. Brainstorm with students to see what they need! As they share, students should take notes on what their partner heard and then they listen one more time. The next part can include a variety of activities. Students should listen/watch one last time and note new words, phrases, or ideas. They can also circle what they heard that their partner shared previously. After they listen/watch the third time, they may work with a new partner to talk about their lists or they may work with a small group compiling a bigger list of words. Students reflect on the main idea and supporting details (below) as an individual and that’s the end of the activity. (I tie this to proficiency level posters I have up in my classroom so students know where they are and where they are going.) Other times students flip the sheet over and write a summary on the back in their own words. Ideally these summaries are in the target language, though for lower levels partners/small groups work together to write the summary in the target language. Other times, going even further, students write questions they still have, questions they would ask the person being interviewed, an alternate ending, or a review of the song. These can be adapted as necessary.  I understood the main idea.  I didn’t understand the main idea.  I understood all of the supporting details.  I understood most of the supporting details.  I understood a few of the supporting details.  I didn’t understood any of the supporting details. Make several class sets of copies of the listening activity and have them ready to go in case something awesome comes up!